On Wednesday, Mar. 1, the United States Mint may increase prices on 17 numismatic gold products. The bureau will also set prices for its 2017-dated Proof American Gold Eagles. They launch on Thursday, Mar. 2. The U.S. Mint’s collections of gold coins have prices that can change weekly depending on the trending value of gold. The Mint most recently raised prices on Jan. 18 when the yellow metal’s average climbed to between $1,200.00 and $1,249.99 an ounce. For the last several days, gold has logged 3-1/2-month highs and is now trading near $1,257 an ounce. If Wednesday’s LBMA gold price for the AM is above $1,234.75 an ounce and the fixing for the PM stays above $1,250.00 an ounce, then prices of U.S. gold coins will increase by as much as $50 for every ounce of the precious metal they contain. The following table summarizes the current and possible higher prices, and includes the upcoming 2017 Proof American Gold Eagles. The United States Mint made two pricing adjustments earlier this year, raising them on Jan. 4 and again on Jan 18. Past adjustments have tended to happen on Wednesdays at around 2:00 p.m. ET. This article will get updated with what actually happens. Update: Gold prices dropped Wednesday, with the PM fixing at $1,240.40 an ounce. As a result, the U.S. Mint did not raise its prices. 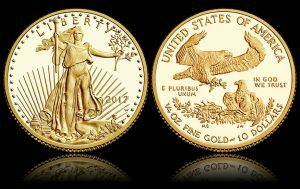 The launch prices of the upcoming 2017-dated proof American Gold Eagles are in the left column of the table above. The coin dealer buy our collection way to low ! Should i continue my gold coin collection, i am near retired .My kids and my grandchildren have no interest in this Hobby. Can someone advice me what to do ? You can give the coin collection to anyone you like. Maybe another relative who might be interested in coins. If not, you can leave the collection to charity or a coin club. If you keep the collection until you pass on, be sure to have a will and a living trust designating where you want the collection to go. Of course, the other option is selling the collection and take a lose on what you paid for the coins. At lease you would recover part of what you paid. gotta buy your pandas (and all coins) from a reliable source, since the US Govt won’t protect us from China counterfeits. So true! China produces more counterfeit coins each year than all other countries combined. Why collectors in the USA trust the communist government of the People’s Republic of China on their precious metals panda coins annual mintage figures is beyond me. And, by purchasing these Chinese bullion coins, collectors are supporting the second most repressive regime on Earth next to North Korea. Sad! On your reply to nygrump, Your second comment is why I have never bought ANY coins from China and never will. it’s a shame we are forced to buy so much stuff from them already.